Look for the largest land-dwelling mammals in Alaska and you'll find them in the north. Polar bears prowl on the northern rim of the state and on sea ice off the coast, as well as on the northern coasts of Russia, Canada, Greenland and Norway. A thick coat of white fur helps bears survive in these latitudes. During the past few decades, scientists have speculated that this fur keeps bears warm because each hair routes warm sunlight to a polar bear's skin. Daniel Koon, an associate professor of physics at St. Lawrence University in New York, became fascinated by the subject when he first read about it in a physics text book. His interest led him to assemble an Internet site that holds a few dozen newspaper and magazine articles that describe how light can travel the length of a polar bear hair in the same way water flows through a pipe. The theory goes like this: sunlight is captured by each hair, directed to the bear's black skin, and converted there to heat, thereby providing warmth to the polar bear. 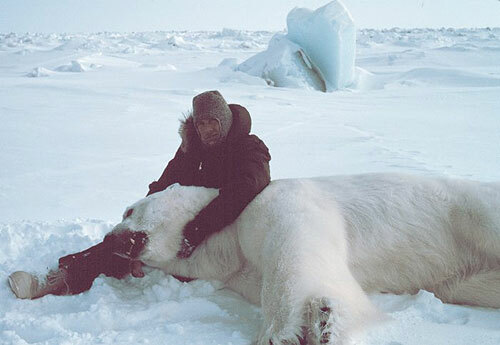 Beaufort Sea, Alaska - May 1982: Steve Amstrup of USFWS with large sedated polar bear - Ursus maritimus. Bears were measured and tagged for future study. This sedated male was ready for the WWF with a 45 inch neck and weighing about 1400 pounds. The hypothesis emerged with a study in the mid-1970s by zoologists from two universities, the University of Guelph in Canada and the University of Oslo in Norway. The scientists discovered that polar bear pelts reflect very little ultraviolet light, which is invisible light that causes tans and sunburns. A few decades later, a team of researchers from the Boston area proposed that polar bears were using the ultraviolet light to warm their skin. Their hypothesis was based on the fact that polar bear hair is transparent. They claimed the hair might work as a fiber-optic cable, through which light energy travels like electricity through a power wire. Though they did not test the theory, it found its way into the mainstream, inspiring articles in the Christian Science Monitor, the New York Times, and Time magazine. Koon decided to test if a polar bear's hair could actually conduct light. Koon and a student, Reid Hutchins, got a few hairs from a male polar bear that lives at a zoo in Rochester, New York. Their research revealed that the popular notion was not correct, they found that less than .001 percent of red light and less than a trillionth of the violet light transmitted traveled the length of a typical, inch-long hair. Even less ultraviolet light made it from the tip to the base of the hair. Koon compared a polar bear hair to a pane of window glass. We can see through a window, but if that same sheet of glass is stacked like plywood and viewed through its edge, the glass appears green. In the same way, a polar bear hair looks transparent when lying on a table, but if you picked it up and tried to see through it lengthwise, as you would look through a telescope, the hair would no longer be transparent. If a polar bear's skin is not absorbing ultraviolet light, where is the light going? Researchers at Penn State University had long ago suggested that the ultraviolet absorption of polar bears was due to keratin, the protein from which hair is made. Koon agrees that keratin is probably the substance that prevents polar bear hairs from carrying light to the skin. More importantly, he thinks the widespread belief in polar bear hairs as light carriers illustrates a problem in science: people want to believe in the fantastic and the fantastic is often accepted without being tested. As writer Bertrand Russell pointed out, even Aristotle--the most famous scientist of his day--claimed that women have fewer teeth than men, though it never occurred to him to check Mrs. Aristotle's mouth. The moral of Koon's study is that a little dose of skepticism never hurts. This column is provided as a public service by the Geophysical Institute, University of Alaska Fairbanks, in cooperation with the UAF research community. Ned Rozell (nrozell@gi.alaska.edu)is a science writer at the institute.